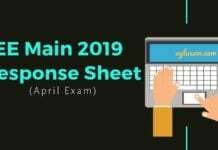 JEE Main 2019 Paper 2 – NTA is going to release the JEE Main Paper 2 Result by May 15, 2019. 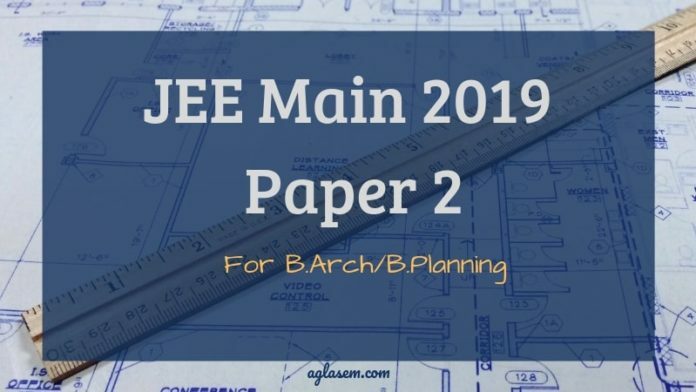 JEE Main 2019 Paper 2 is for candidates willing to take admission in B.Arch and B.Planning courses in the NITs/IIITs/CFTIs. The paper 2 exam is held in 3 parts. Part 1 and part 2 is Mathematics and Aptitude section respectively whereas part 3 is the drawing section. The qualifying candidates have to appear in the JoSAA/CSAB counselling for admission. 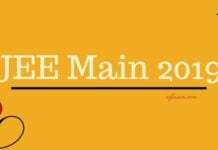 The candidates can check here the complete details on JEE Main 2019 Paper 2 including cut off, result, etc. from this article. Latest: The candidates can check the paper 2 answer key by NTA from the link below. 1,69,767 candidates have registered in the Paper 2 of JEE Main 2019 April attempt. Part 1 and Part 2 of the exam was held in online mode and part 3, i..e drawing test was held in offline mode. 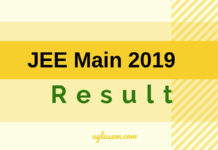 The result for JEE Main 2019 Paper 2 will be declared online at jeemain.nic.in. To check your NTA score, log in by entering your Application Number and Date of Birth. The qualifiers in the entrance exam will then be allocated seats. The Centralised Seat Allocation Board (CSAB) / JoSAA or the concerned State government/institute will be hosting the same. The JEE Main Paper 2 Result is compiled on the basis of final answer keys. The best of two marks of those candidates who appear in both the attempts will be considered. At the time of the declaration of the result, the cut-off score for qualifying JEE Main Paper 2 2019 will also be released online. NTA releases the response sheet and question paper officially on the website after the examination. Candidates can download the question paper and the response they submitted by logging in. It must be further noted that the response sheet is only available only for mathematics and aptitude section. No response sheet and question paper are available for the drawing test section. NTA releases the answer key over the official website. Candidates can match the answer marked by them with the answer key released. Also, similar to the response sheet, answer key is available for only mathematics and aptitude sections. The answer key for drawing test is not available. In case of any mistakes found by the candidates in the official answer key, they can object the same, with valid proof. The candidates who have successfully registered for JEE Main April session 2019 must download the admit card. The admit card is available online at jeemain.nic.in until April 7, 2019. Candidates will need to log in using their application number and password/date of birth. It is mandatory for every candidate to carry the admit card to the examination centre. Note that the admit card will not be sent by post to any candidate. Candidates have to carry their own cardboard with nothing written on it. Also, pencils, erasers and crayons are to be carried by the candidates. On completion of the test, the candidate must hand over the answer sheet to the Invigilator. Exam Mode: Online (Part 1 and Part 2) and Offline (Part 3). Part I & Part II: Each question carries 4 marks. For every incorrect attempt 1 marks will be deducted. Part III: One question carries 30 marks and two questions carry 20 marks. Texture related to Architecture and build~environment. Visualizing three-dimensional objects from two-dimensional drawings. building forms, and elements, colour texture, harmony, and contrast. elevations and 3 D views of objects. Sketching of scenes and activities from memory of urbanscape. public space, market, festivals, street scenes, monuments, recreational spaces etc. As the exam dates are near candidates must understand the importance of smart work.I n order to prepare better in a few days for the exam. Let us see some points are given below to prepare for JEE Main paper 2, April session 2019. Make a proper study timetable. To score well in the examination, Practice as musch as you can. Practice mock tests to know your weak areas, atlest take one mock test each day. Do not stress over the test and keep yourself healthy. The cut off is prepared by considering various factors of exam.some of them are number of candidates appeared, difficulty level of the exam, etc. Until the JEE Main Paper 2 Cut Off 2019 is not available, the candidates can check the previous year’s cut off from the table below. Age: There is no age limit for candidates appearing for JEE Main 2019 Paper-2. The candidate should have passed 10+2 examination with 50% marks in Physics, Chemistry and Mathematics. Also 50% marks in aggregate of the 10+2 examination is mandatory. Candidate must secure at least 75% in class 12 exams (60% in case of SC/ ST category candidates). Or the candidate’s score should be in the top 20 percentile of the respective board. Candidates appearing for JEE Main 2019 Paper-2 should have Physics, Chemistry, and Mathematics as a subject in their class 12. Candidates should have passed or will pass, class 12 exam in 2017, 2018 or 2019. The JEE Main application form was available only in the online mode. No offline copy was provided to apply for JEE Main. Aspirants who wanted to apply for JEE Main 2019 did not require an Aadhaar Number. In addition to filling personal & academic details. Candidates also had to upload scanned images of photograph and signature. JEE Main 08 Jan 2019 Check Here – Available! Check Here – Available! For more information – Download Information Brochure. YOU ARE NOT ELIGIBLE FOR ADMISSIONS IN IITS NITS AND GFIS. 200 MIGHT NOT LAND YOU INTO A GOOD INSTITUTE. i m expecting about 200+ in jee paper 2 can i get a good government college ? As the result had already announced now you can’t rectify this thing. I am expecting 200 marks in paper 2 can i get an nit.? There are ample number of chances on the basis of last year’s cut-off that you will get admission in NIT. I belongs to sc category i’m getting 96 marks in jee paper 2 could i get seat in NIT???? As per the marks your predicted JEE Main 2018 rank is: Between 74000 and 120000 .So for NIT it will be a little bit difficult but you can try for other good institutes. So can i get admissions through jee …. As you have secured good marks,but still you need to wait for the cutoff marks/ merit list which is going to released soon. I got 196 in paper..will I be qualified for any collage? You need to wait for the cutoff list. I have scored a Rank of about 43000 and 85 percentage in 12th so is there any chance of getting admission? you need to wait for the cutoff list as it will announced soon. You jee Main paper 2 2018 score is 134 and general rank is 74296 can I get a good college ? Hi Mimansa you need to wait for the cutoff list as it will announced soon. Sir what is the minimum mark in jee paper 2 for BC candidates? As per the stats taken from the last year is 49. I secured 207 marks in jee mains paper2 and 95% for 12 th boards.Would I get any nit’s or not,if I’m a general candidate. Hi, my jee paper 2 score is 162, and rank is 46534 where can i get admission please let me know. Sir mara jee main paper 2 ma 231 mark aya hhh or mari OBC ma 924 rank hh muja government college mil skta hhh ….. ? I have secured 144 in JEE MAIN paper-2 and 62% in boards. I belong to general category. Will I get admission in a good government college? Hi Dishna you have to wait for the cut off list. I got194 marks in paper2 and 85%in class 12.I belong to BC category.Did I get any seat in but. Hi there, there might be chances to get a good college but you have to wait for the cut off list. 90% in 12th 218 in jee paper 2 which college options are available for me. As you have secured very good marks in exams and in JEE Mains,there is possibilities that you can get good colleges but you have to wait for the cut off list. Hey i got 94 marks in paper 2 and i am general category…. so can i get NIT???? You have to wait for the cut off list which is going to be published very soon. I’ve got 157 marks in paper 2 and I belong to sc category …. can i get a good government college…??? Hi Nandan, as you have secured good marks in exams there is possibilities but you have to wait for the cut off list. i have 177 marks in jee paper 2 and 87% in 12 can i get nit ? As you have secured good marks in exams there is possibilities but you have to wait for the cut off list. Hi there ,you need to wait for the cut off list which is like to be published very soon. Hi in JEE MAIN PAPER-2 RACK IN CRL IS 1273 AND OBC IS 257,I GET SEAT IN IIT COLLEGE. Hi Shalu,you need to wait for the cut off list which is like to be published very soon. My daughters rank in JEE MAIN PAPER 2 is in 18459,OBC RANK 5407,whether she is to get admission in good college? She just need to wait for the cutoff list which will be available soon. sir i got 173 marks in jee paper 2 obc category..which college can i get? You need to wait for the cutoff list after that you will confirmed about the colleges so wait for it. I got 179 marks(OBC) in B.Arch ..
my rank in CRL is 10113. May I get admitted into any college ..? You need to wait for the cut off list,but as stats of the last year it might be possible that you got admission in a good college so hope for the best. Sir I scored 134 marks in paper 2 (general)is there any chance of mine to get government college.is there any advance paper for it also.please reply me I am very confused. As per the stats taken from the last year the cutoff is 81 so hope for the best and need to wait for the cutoff which is going to be released soon. I got 141 marks in jee paper 2, i belong to schedule tribe… Will i get admitted to any colleges? Hi there, you need to wait for the merit list which is going to released soon. you need to wait for the cutoff and the counselling. you can apply for Architecture aptitude test (AAT) and the registration will be starts from 10th June. Hi Sir. Got 210 marks in B Arch and the rank is 11518. OC Catagory. Is it possible NIIT Warangal. Mention previous allotments in NIITs please. hi krushna as you have got good marks in JEE Mains, you will be sure once the cutoff will released. I got 195 marks 21021 rank so can I get a seat? ? as you have got good marks in paper but still you have to wait for cutoff list. i got 173 in jee paper 2 (obc) ….will i get admission in any govt colleges? as you have got good marks in paper in obc quota but you have to wait for cutoff list. i got 173 in b arch paper…will i get in any govt college? yes by looking last year stats it might be possible but you need to wait for the the cutoff list. Hi, I got 136 marks in jee mains 2 & I belongs to OBC is there any hope to get admission in any Govt college. Also can anyone help when counselling starts for paper 2.
as you have got good marks in paper and looking buy the previous year stats it might be possible that you can get the good college and the counselling will be stats very soon. Hi there, by looking at the stats of previous years it might be possible that you got the good college. hi Ayush,you can apply for Architecture Aptitude test and the registration will be started from 10th june. can i get any chance? According to the stats it might be possible that got a good college but for making sure you need to wait for the cutoff list which is going to be published very soon. Hey there,as you got good marks in JEE Mains paper 2 but you need to wait for the merit list/ cutoff list which is going to be published very soon. Sir i got 162 marks general category. Can i get admission in om dayal westbengal? Hey there, you need to wait for the merit list/ cutoff list which is going to be published soon. Otherwise you can use your JEE mains paper 2 score card for admissions in other colleges. I got 182 in jee paper 2 .. is there posiable to nit for me ? hi Raj, you need to wait for the merit list/cutoff which likely to be released very soon. as per the last year stats it might be possible that you got it but to make sure you need to wait for the merit list. Sir/madam can you please update the cut off mark for jee paper 2 ?? please me that my admission will be done in B.Arch. Hey Rohtash, the cutoff will be released soon so you need to wait for it and you can also apply for Architecture Aptitude test and the registration will be starts from 10th june. Sir I got 176 marks in paper 2 and I’m an sc and my sc catogery rank is2450 do I get seat in NIT? I got 175 marks in jee paper 2 B arch. Sc catogery rank is 2589 do I get seat in NIT? i got 127 marks in Jee Paper-2 and got 95.2% in Qualifying exam is there any chance to get seat…! when will the cutoff come ?? The cutoff for the JEE Mains will be released soon. When will the counseling start for JEE Mains Paper 2? And where should we apply? sir, I got 206 in JEE 2nd paper. In whick college i will get admission ? As per previous year cut off, you will be able to get a college. However cut offs might differ from previous times.You should definitely look forward to counselling rounds. Sir I got 178 marks in paper two with obc rank 10588. Can I get govt seat in best clge. I don’tknw Hw to go for verification and councling. Plzz give me guidence air. As of previous year data, it is really difficult to get a good seat with 10588 rank. The minimum eligibility criteria for NIT is 75%in Class 12 with Math as compulsory. Sir/mam.. I got 154 marks in jee paper 2 with SC rank 4088.. Can I get any Nit? According to previous year data, it looks unlikely that you will geat into NIT. None the less you can still try to opt for other good colleges as well. Closing rank for NITs in SC category is under 1000 generally. So it wont be possible for you to get into NITs. Can I eligible for councling??? My Jee mains paper 2 score is 192 and Rank is 22670 and I belong to General Category. Can I get seat for B.Arch in any college? Is he get good govt college . merit cut off kitni rahati h.
can admition a good govt college . refer this link for better understanding of the cutoff marks https://admission.aglasem.com/jee-main-paper-2-b-arch-b-planning/. i got 211 in jee paper 2 and 63% in hsc . so in which college i get admiswsion? Sir,i got 115 in jee paper 2 and 62.8%.Can i get seat for b.Arch in any college. can i eligible for counselling?? Sir I got 203 in jeemain paper2 . When will the counseling procedure start???? Am I eligible for any govt.college? I belong to obc(ncl)qoata. i got 198 marks and 18457 rank in jee main paper 2 and secured 80% in 12th state board.what are the colleges may i get seat? sir my son get 137 marks in jee main 2 2018 from obc category rank 22470 and all india rank 67268 But he is not qualify in jee main paper 1 so is he get govt college. Sir,When Will Be The Counselling starts For Jee Paper 2 Students?? Should we particilpate in Jee Counselling from June 15th onwards Or is there any seperate Counselling criteria for this? there will be no separate counselling scheduled for JEE main paper 2. You need to apply for the counselling which is going to be on !5 june through it only you are going to select colleges of your interest. hey there you need to wait for the cutoff list as it will be release soon. JEE MAIN paper 1 and JEE MAIN paper both are for different things 1 is for the engineering and the 2 is for the Architecture so it is not required to clear the JEE MAIN paper 1 for the admission in JEE MAIN paper 2. Hi my daughter got 127 marks in JEE Main paper 2 with rank 75401 and we fall into general category and she scored 90% in 12th board so please do let me know if we get any good college for this rank and send me the link where we can apply for online counselling. We tried but not able to get proper link. Please help us as soon as possible, appreciate it. Hey there as she can got a good college counselling will be start soon so stay tuned. Sir I got 215 marks in jee mains paper 2 and my all india rank is 9019.. and in 12th i got 85.4%.. when will be the counselling start?? And which college would i get?? Sir jee main 2 ki registration date 15 th june hi he kya . Please reply me . I got 150 marks in paper 2 and my rank is 57032 . Can i get any govt. College…. It would be difficult to get a government college, you could look for good private college options. Sir I have got 124 marks in jee mains paper 2 2018. From sc catagory and my rank is 6603..can I get a government college? ?… Plzz reply me. hey there it may be that you’ll get the college. Is there any councling In jee Main paper 2. …. yes there is counseling and it already started. Hi sir I have got 126 marks in her paper 2 I an .cat-1 so can I get any college plz reply me argent. hey there yes it may be possible that you’ll get the college. what is d criteria for calculating the total marks for JEE MAIN PAPER 2? my son has secured 34.92/120 in maths, 94.7/200 in aptitude and 72.47/70 but his total is 84.98. can anyone please clear my doubt? My Daughter secured 98.8653469 NTA score in Paper-2 JEE Mains 2019 (first attempt), what is % she need to get in 12th CBSE to get admission B.Arch. in good collage. she needs to acquire minimum 65%to secure a good college for architecture.